Some of the best business ideas happen by accident. Often they’re created just by someone trying to solve a problem they themselves have. And that’s exactly what happened with online city guide Atlas Lisboa. 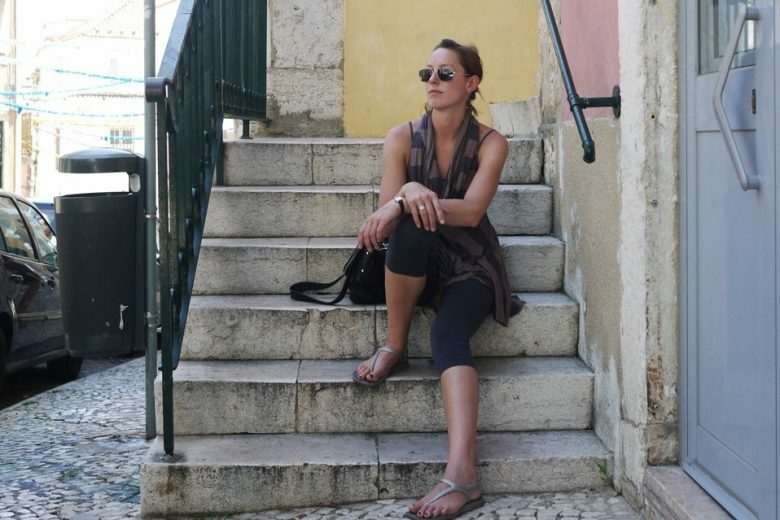 Read how creating a one-off guide to Lisbon for friends visiting in her absence led Ellis Dixon to launch the ‘people’s guide to Lisbon’, and why she had to stop herself hugging the first stranger she heard talking about it! My background is in fashion design, which admittedly isn’t a typical beginning for a founder of an online city guide. My focus was in contemporary women’s clothing and I worked in New York’s fashion industry for almost 10 years before deciding to pack up and leave for a long trip to Central and South America with an open return date. Transitioning from a Brooklyn apartment with a sizeable garment rack and at least a dozen pairs of shoes to the back of a bus and a backpack with just a few outfits stashed away was liberating more than it was limiting. About a year later, my partner and I returned to New York and it was clear that a drastic change was in order. We set our sights on Europe and fell in love with the first stop on our list: Lisbon. I now freelance as a designer when I’m not running Atlas Lisboa. Where did the idea for Atlas Lisboa come from? Four years ago at around Christmas time, my dear friend from Brooklyn announced that he and his girlfriend had bought a ticket to Lisbon to come for a visit. My partner and I had literally just purchased tickets to spend Christmas elsewhere and were so saddened that we couldn’t guide our friends around the city. So we set up a web page as a guide to the holidays in Lisbon specifically for them. It grew to what it is today because of that post— not only did it help them out, it helped many other English speakers who were looking for information on the very same things. We felt that we owed it to people like ourselves to continue. I never could have guessed what was initially intended for two sets of eyes would blossom into about 60K unique views monthly. Atlas Lisboa grew slowly over time, especially in its first year, until we realised we were one of very few non-corporate sources of information in Lisbon publishing honest content and helpful tips to travelers. As travelers — and freelancers looking for work — we knew the extent of paid-for glowing user reviews on the big user-submitted review sites, and as social media users, we knew product placement has become a multi-billion industry. And that’s exactly what we kept finding in Lisbon when looking for information. We wanted to be the opposite of that. There was (and is) incredible freedom and responsibility in that. What makes Atlas valuable is its honesty, its irreverent tone, and the expertise of the people behind it. Many travel websites we’ve encountered often have affiliations that make their recommendations suspiciously over-enthusiastic, and most businesses claiming to offer guided travel experiences turn out to be fly-by-night operations led by people with little relevant expertise and devoid of any passion for their subject matter. Atlas steers clear of favoritism, brings curated content in an engaging way, and relies on a team of local experts to tackle what we see as a sad trend toward impersonal travel for the sake of ticking off boxes. If we wouldn’t go there, do that, or find that thing interesting, we just don’t write about it or offer it on our marketplace. This is why we are known as the people’s guide to Lisbon. Curious locals and visitors who are explorers and wanderers — and doers. By that last part, I mean people who believe in leaving a smaller footprint and helping the communities they travel in. There’s no age limit, there’s no pay grade, there’s plenty to do out there that we can recommend for just about anyone. We get a bit snarky at times, so you’ll need a sense of humor, but that’s about it. Since our site comes up in the top search results on pretty much any query you can make on Lisbon, people seem to find us and keep coming back for more. It’s incredibly rewarding to know that the reason we rank so highly is because people (and the almighty google) trust us. Since we are launching our tour marketplace of curated experiences, our strategy will incorporate direct outreach, which we intend to do primarily through guerilla marketing, to stick with the ethos of our site. Fortunately or unfortunately, it’s been our solid, regular, trusted content that’s led to the site’s visits continuously growing. And we’ve had great success engaging people with unconventional ways to explore the city. One such strategy, for example, was to hand out antique keys during Websummit to curious — and curious-looking! — individuals, who could then use the QR code on the keychain to unlock treats such as free drinks at several secret locations. We like to be creative and work with enthusiastic people, and like many things we’ve done at Atlas, this was an idea that was embraced and then developed organically, and somehow just in time for the big summit (phew!). Time. This has been a pet project that started as a bean and has now grown legs and is running circles around us. Each person who works on Atlas does it in their free time, so it’s often difficult to balance life, work, and the work it takes to manage a website. Now that I’ve got Emma (my seven-month-old daughter), time management has become crucial. Did I say time management? I meant naps. Long ones. Just like in fashion design, there isn’t a prouder moment in your career than the first time you see someone on the street wearing one of your creations. That’s similar to my proudest moment with Atlas: I overheard a conversation about how two people ended up coming to a venue and they mentioned Atlas Lisboa by name. I wanted to turn around and hug them both excitedly, but in the end, I figured that would be weird and creepy. Maybe it’s the New York thing, and maybe it’s just in my blood. New York instills in you the idea of the constant hustle, while my southern American roots remind me that ‘idle hands do the devil’s work’. Sitting still has never been an option. Aside from giving me an overwhelming sense of purpose, Atlas Lisboa fosters continued exploration of an ever-evolving city by virtue of its maintenance. I think our readers would agree on that last part as well, and that’s a win-win situation for us all. The added benefit of giving Atlas readers the tools they need to experience the city on their own terms makes it truly rewarding. Audrey Hepburn. At a glance, her beauty, grace, charisma, and talent are immediately apparent, but if you look more deeply at her story, you’ll find out that, as a teenager, she put on silent dance performances in order to raise money for the Dutch resistance effort in the Nazi-occupied Netherlands and later had to give up her ballet career due to wartime malnutrition. She came to acting out of necessity and was rewarded with dozens of film and theater awards over the course of her career. She used her later fame as a UNICEF ambassador, traveling to war-torn and impoverished countries to lend a hand up until only a week or two before her death. And during all of this, she still managed to be a style icon. Now that’s multi-tasking! Her story tells me that you can, in fact, do it all with grace, even when things get tough. I’m always critical of my performance in each of these elements, so this is a tough question to answer. I try to approach each day in bite-sized tasks that add up to a whole week’s worth of work with quality time intervals with my daughter and husband built in. Having a clearly-defined list of goals for the week that benefit my work and family is important because some days I’m able to do more than I thought, and other days I’m struggling to do things halfway. After a week has gone by, the work list is mostly done, so making my lists malleable to “special moments” with my daughter is key. Not being too hard on myself if I can’t accomplish everything is paramount, and having a partner who picks up the slack when I need help should not be overlooked. He also takes the time to look after me, which gives me an incredible advantage. So far, there haven’t been any casualties, so I guess we’re doing something right. Goals are important, but taking each day at a time is the only way to achieve them with your sanity intact. The only way to eat a whale is bite by bite; the only way you build a site is page by page. Failure is often necessary and can lead to a better outcome than you ever thought possible. I had a fashion line in New York that ultimately went under — and I was destroyed. Looking back, if that hadn’t happened, I wouldn’t be where I am today, I wouldn’t have traveled the world as I did, and I wouldn’t have moved to Lisbon and made Atlas Lisboa. I wouldn’t trade my life with anybody. Curiosity leads to finding new interests, new loves, and a clearer sense of self. Watching my seven-month-old daughter, as she experiences things for the first time, is inspiring me to do more of the same, and that’s something I hope inspires our readers. The experience marketplace in particular is a way we hope to make trying new things with passionate people even easier. You can find out more about Atlas Lisboa on their website.